Home Steve the Robot H.E.Ai.D. Steve the Robot H.E.Ai.D. was a 35 foot, interactive, collaborative installation that allowed people to create sound together, using video sensors to collect people’s motion and interactively generate music, voices and lasers. 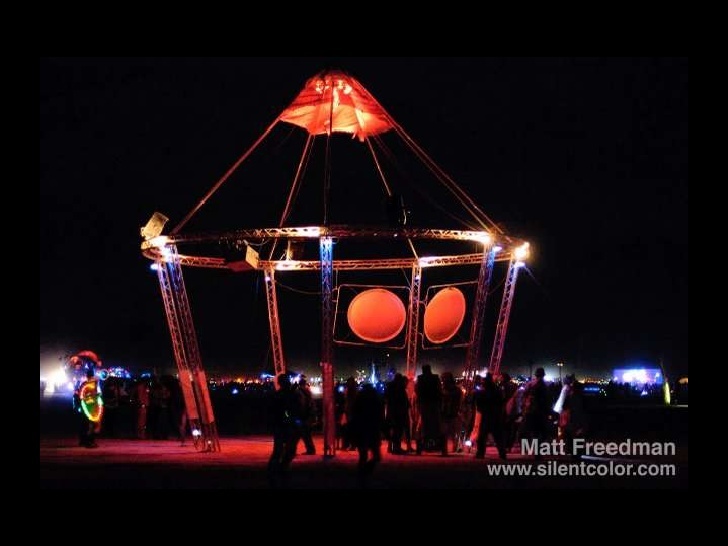 This was a very large scale project, funded by the Burning Man organization for installation in 2009, and which since appeared at several events. It was made by the the same team in a previous incarnation called UberGeek. Check out the video at https://www.youtube.com/watch?v=O6OW1RqX6lk. The original vision was shaped by our fascination with how the process of cultural evolution has been accelerated by technology. As we integrate technology into our collaborations, these collaborations become their own persistent meta-beings comprised of both technological and collective biological parts. With Steve: The Robot H.E.Ai.D., a H.uman E.nergized Artifical i.ntelligence D.evice., we explored the idea that the next step in our human evolution is when these meta-beings wake up, become in some way self-aware, and start speaking to us, its individual nodes, within its own larger brain.